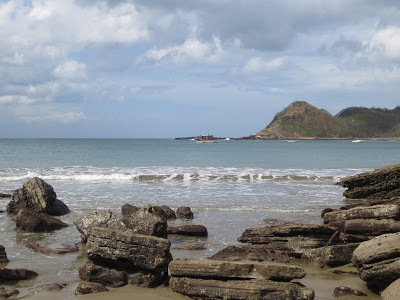 This month, I’ve been writing about some of the wonderful beaches we’ve had the fortune to visit, and I’ll end with one we visited last month: the beach at Morgan’s Rock near San Juan del Sur, Nicaragua. 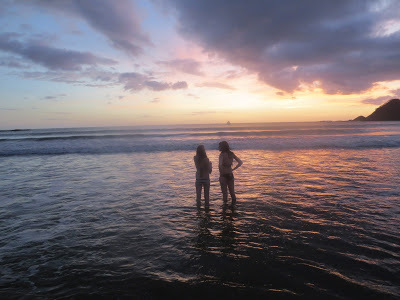 We had loved Costa Rica so much when we visited a couple of years ago that we wanted to go back to Central America. 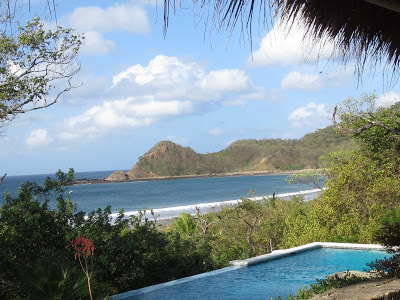 After doing some research, I kept coming back to the idea of travelling to Nicaragua. It stood out as a wonderful potential destination, with its combination of natural beauty, the lovely Spanish colonial town of Granada, and the friendly people who live there. Nicaragua met and surpassed our expectations. 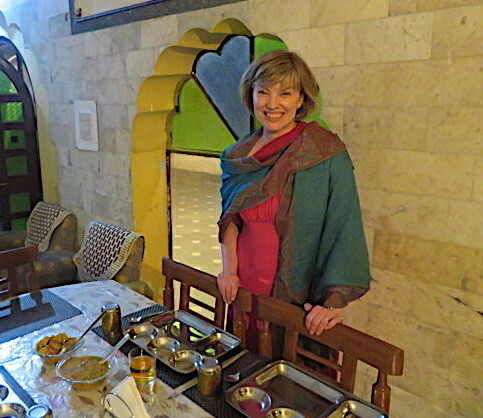 If you read this blog regularly, you’ll know that I love exploring the countries we visit. I’ll be sure to write another day about our adventures around the country, from exploring Granada’s islets by boat to hiking around the Masaya volcano, from visiting a local pottery workshop to taking in beautiful views of Apoyo Lagoon. But today I’m writing about the beach. We took long walks in the sand and played in the water. We went kayaking in an estuary just off the beach, and we witnessed some of the most beautiful sunsets we’ve ever seen. We scrambled over rocks to find a hidden cave that could only be seen at low tide. We even attended the best New Year’s Eve party ever on the beach, complete with an effigy that was burned to celebrate the end of the old year (a Nicaraguan custom). You probably won’t be surprised to hear that we all fell in love with this beautiful country. 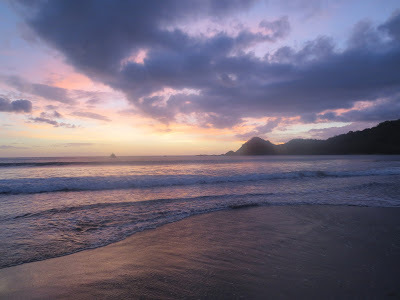 On a winter day like today, when the wind is howling outside my window and the snow is drifting, all it takes is a look at these photographs to take me back to Nicaragua and this lovely beach. Splendid. When I saw Granada on the Travel Channel a few years ago, I feel in love immediately. 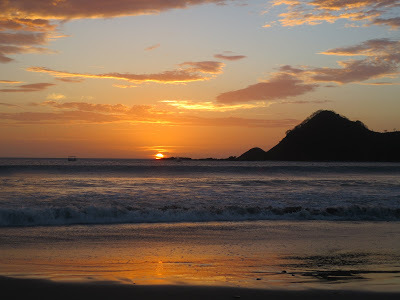 Nicaragua looks incredible right about now…in fact, any warm beach would do as the wind is howling outside! Folks usually don't think of beautiful beaches, but boy do I want to go to there! Amazing photos! The first photo of sunset looks incredible. I'm always so jealous of your photos. These look great! What stunning photos my friend! Just splendid. Such beautiful natural pictures. Thank you for sharing…and for your kind and generous words. I hope you have a beautiful weekend with good food and friends. Gorgeous photos! Love the beautiful sunsets! Love the photos. Makes me want to go there even more than I did before. And I really wanted to go there before. Ha! I can't promise adoption, Stina, but if I make it out to Calgary some day I'll take you out to lunch! Ahhhh, it would be so wonderful to be there right now! Gorgeous photos, Beth. Gorgeous! I love the top photo. Stunning pictures! I didn't know Nicaragua had such gorgeous natural beauty! Had no idea the beaches there were so lovely. Thanks for taking us with you! I really wish I were at the beach now! What gorgeous views! wow, gorgeous! my sister spent 8 months in nicaragua and thought she`d be there longer, so of course i thought i had more time to visit her. my mistake! !